Why an R.F. 60 ? Homepage Need a V5 Registration Document ? Why an R.F.60 ? 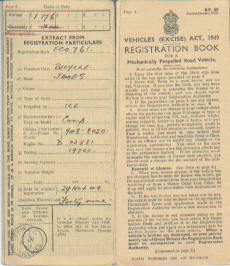 The R.F.60 is the old card 'log book' that was in use before the V5 registration documents (now V5C) were introduced by DVLA. If you have one that carries the frame number of the machine for which you are claiming the registration number, you are almost certain to be allowed to retain that number for your machine. An R.F.60 is the best type of evidence to support your application.